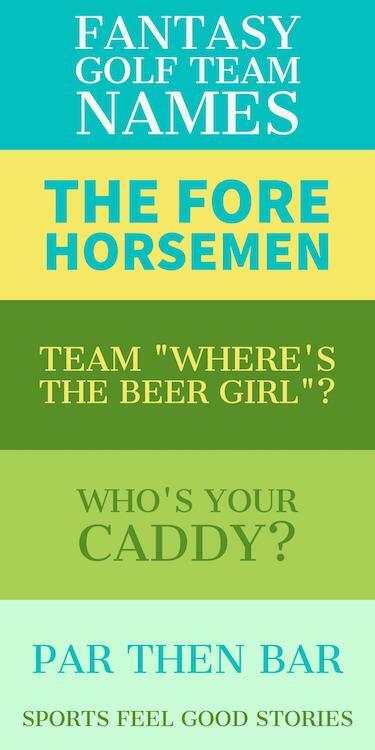 Coming up with the best golf team names usually means examining words associated with golf and developing some word play and puns to arrive at a fun solution. Your team name – whether it’s for your local club tournament, company tournament or fantasy golf – is more important than what many folks think. In some cases, depending on the league you join, or platform of play you pick, your team name is pretty much all that other players (and who knows, even spectators) will know of you. When you choose your name, be creative, be clever, be witty and have fun! Remember, don’t be a drag – have some fun with it. Here are some ideas to use, or even better, use for inspiration. Good luck! Where’s the first hole and what’s the course record? We spend more time in the sand than the Beach Boys. Put Me Down For A Par. 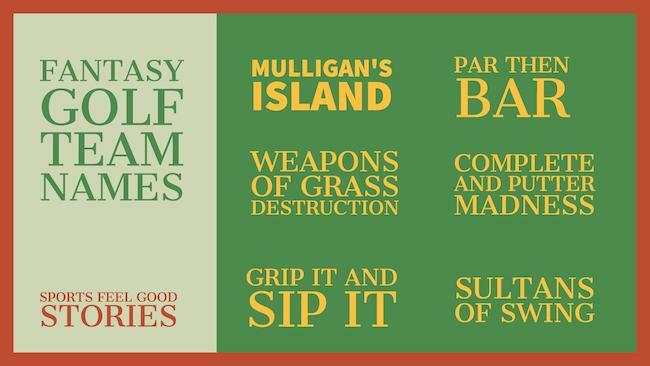 You might like our Big Golf Quotes Collection. Grip it n’ Rip it. White Tees in White T’s. What makes great Fantasy Golf Team names? Well, like any other good name, it must communicates a lot about you. Real golf has a reputation of being stuffy – a rich man’s game. But, the world of Fantasy Golf is nothing of the sort! How cool is it to play golf without having to play golf? It’s a great way to enjoy time with friends and a great way to make new friends. Save the green fees, don’t worry about the clothes and no caddy needed. Pick your players, join a league and you’re pretty much set! Dance Floors are Foreign Land. Learn more about Fantasy Golf at Wikipedia. “Where’s the Beer Girl” Tourney. If you have any suggestions for our Fantasy Golf Team Names, please let us know via the Contact page. Thanks!